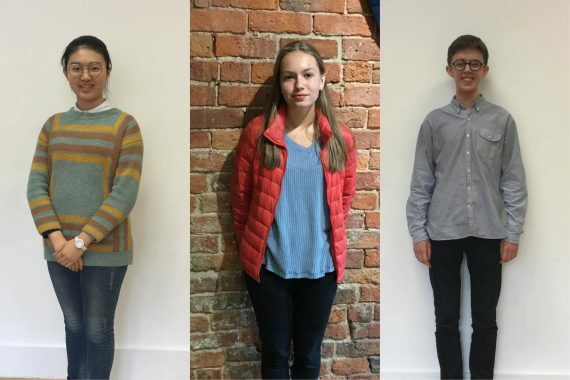 Each spring, three Chetham’s students from years 12 and under are selected as soloists. who will perform in the school’s major concerts the following year. Choosing just 3 out of 300 of the world’s finest young musicians, all of whom would stand out in other company, is a formidable task; but it’s one which allows us to showcase and celebrate students’ musical development and to provide a level playing field from which to pick our soloists. With so many students playing at an exceptional standard, the Concerto Auditions are formed of several rounds. Over the course of a week students play in departmental auditions, before a final twelve are selected for public Concerto Finals on The Stoller Hall stage. For this, we were delighted to welcome a quartet of knowledgeable judges to make the final decision alongside Director of Music, Stephen Threlfall. Martin Roscoe, Professor of Piano at Guildhall School of Music, has enjoyed an extraordinary career spanning over four decades. Bob Riley, CEO of Manchester Camerata, was named Orchestra Manager of the Year at the ABO/Rhinegold awards in 2017, and has seen his ensemble billed as, “Probably Britain’s most adventurous orchestra”. Quentin Poole, Conductor, Oboist and Educator, is a Fellow of the Royal Academy of Music and was for many years Director of Music at the Purcell School in Hertfordshire. Finally, Nick Thompson, Head of Wind, Brass and Percussion at RNCM, joined the panel in his first year in Manchester following a 30 year role as Principal Trumpet of the Chamber Orchestra of Europe. Over six hours, the judges heard twelve concertos for instruments as diverse as cello, French horn, piano and marimba. The doors were opened to fellow students who dropped in to support friends and classmates, and to a public audience coming to see how closely their assessment matched that of the panel. Students ranged in age from 15 to 17, and came from Russia, China, Bulgaria and Belarus, Korea and Venezuela, as well as various parts of the UK. Their chosen repertoire encompassed the classicists, Tchaikovsky and Weber, to 20th century Shostakovich and Prokofiev and living composer Emmanuel Sejourné. Molin Han, 17, is a violinist from China. She performed Prokofiev’s Violin Concerto No. 2 in G minor alongside accompanist Brenda Blewett. After attending the Shanghai Conservatory of Music Affiliated Primary School, where she won first place in the entrance exam, she played with the China Youth Chamber Orchestra as chief performer and the China Youth Symphony Orchestra. Molin joined Chetham’s in September 2017 to study with Jan Repko, who has supported her in concert performances including the Menuhin Competition – as the youngest player in the Senior Group – and Chetham’s programmes in London, Manchester and the upcoming Shaldon Festival, performing solo repertoire. George Herbert, 17, joined Chetham’s as a chorister. He went on to focus on trumpet until joining the Sixth Form in September 2017, when he switched his main study to voice and organ. It was the organ which George, from Cheshire, showcased on this occasion, performing Poulenc’s Organ Concerto in G minor as the first public performance on The Stoller Hall’s chamber organ. With tuition from Christopher Stokes he has had opportunities to perform on the new Stoller organ at Manchester Cathedral and at The Bridgewater Hall with Chetham’s ensembles, and in 2018 gained his ARCO Diploma. Rose McLachlan, 15, from Stockport, played Ravel’s Piano Concerto in G major. After joining Chetham’s as a chorister in 2010, she now studies piano with Helen Krizos. Rose was the 2016 winner of the Scottish international piano competition youth prize; in 2017 she was awarded the LtCL diploma with distinction; and she will shortly appear on a new album of John McLeod’s complete piano works performing his Hebridean Dances. Last week, since her success in Chetham’s Concerto Auditions, Rose won the Duet group prize for her performance of Chopin’s Third Scherzo in a competition with students of Chetham’s and the RNCM. Our congratulations to all who performed; and thanks to all of the tutors, accompanists, and particularly our guest judges, who supported the Concerto Auditions. We look forward to hearing the solos performed by the successful students in 2018-19.